Let us digress for a moment by saying we are actually very smart. Really. While we admit padding our college GPA with extravagant grades from our theatrical lighting design instructor, we do manage to grasp concepts such as parallel universes, wormholes, and the fact that Universe is gradually going room temperature. Given our science fiction readin� and role-playin� gamin� geekish past, we figured we could approach a movie about time travel without fear. We had not, however, figured on Primer's ability to twist one�s mind into an elaborate pretzel, and we now feel about as smart as a bag of hammers. A strange thing happened � even though we didn�t know what was going on, we still kind of liked it. It was like watching someone incredibly smart think aloud. Even though most of it sounded like gibberish, we couldn�t help but feel smart by association. Unfortunately, the production value on Primer was not the best. The whole movie was a little too dark and smudgy for our taste, and this doesn�t help when there are multiple timelines to keep track of. 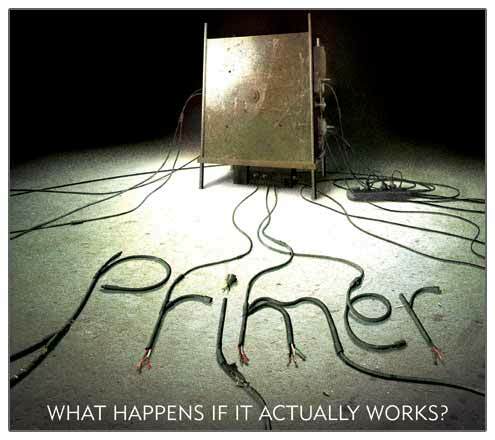 We are aware that Primer was made with an admirably low budget, and it shows at times. However, we had a special fondness for the box itself, which looks like it was tacked together with tin foil and the remnants of an eighth grade science fair. It has just the right balance of ominous cheesiness, and reminded us fondly of the first season of Red Dwarf, where the enormous city-sized mining ship basically consisted of two rooms and a corridor, filmed from different angles. At any rate, the parts of our brain that haven�t been fried beyond repair are still thirsty for knowledge. Seattle Maggie will send a free Primer poster (compliments of the Varsity in the U-District) to anyone who can explain the last half of the movie to us, especially the parts about the guy with the shotgun and the comatose boss, what exactly happened with the multiple Aarons, and the whole concept of the Fail Safe box-in-a-box. Please use short sentences and, if possible, avoid using the words �continuum�, �paradox�, and �Weeble� � they still make us break out in a cold sweat. Great write up. I felt as smart as a box of hair after my trip to the Varsity for Primer. In search of answers, I stumbled across this page. It helped me a bit, but I still have no idea what the scene with Aaron, Abe, and the flashlights were all about. Were they looking for a cat? 1) If Abe also has a double, whom he got rid of somehow to take over his own past, where is the double? Dead, or stuffed in another attic? Also, I was under the impression that there were many MANY Aarons, not just 3, but maybe that was my misunderstanding. Also, if you kill your own double, what does that do to the timeline? 2) Why does Aaron want to perfect the moment with Abe's girlfriend? I mean, if I were going to become godlike and prescient, I would use the opportunity to wipe out some terrorists or cast some extra votes in Florida or something. It just seems to me to be something totally random for him to fixate on. 3) What ultimately happens to Mr. Granger? He just disappears, but maybe we are supposed to lose track of that timeline.